I know I don’t post much over here anymore and that’s because, if you’re not aware, I am a YouTuber over on my channel ProudFangirl which I will link at the end of this post! Anyway, today’s post is probably one of the most exciting things I have ever done so far! Today is my day on The Wrong Train blog tour- ENJOY! Imagine you’ve just managed to catch your train and you realise it’s the wrong one – you’d be annoyed of course, but not scared . . . Yet. Imagine you get off the wrong train at the next station hoping to catch a train going back the way you came but the station is empty. Again you’d be annoyed, but not scared . . . Yet. Imagine someone comes to the station, someone who starts to tell you stories to help you pass the time, but these aren’t any old stories . . . Scared yet? You will be. So basically, I read this book on a plane, to America. Trust me, being trapped in a plane with this thriller was one of the scariest things. Sort of had to switch. One short story. One snack. One short story. One snack. Just a little reward to myself for reading a scary story. Ugh, I’m such a child. Now I’m a fat child. But anyway, my thoughts. I loved this book, if you couldn’t already tell. Despite the fact that I was grateful to be in such close proximity to my parents for the entire time I read this book for, I felt completely absorbed into this story. I wasn’t on a plane at all. I would be in a back garden. A haunted house. A train station. All because each story was so different and so well written that I was sucked into each story. Terrified to read but compelled to continue. I cannot pick my favourite story because I think each story is so different that it’s not fair to single out an individual one. I loved each one. Even before I opened the book. I remember getting this book in the post and shoving in my bag, putting it straight at the top of my list to read at the airport. Caitlin sat opposite me at the table with the pen in her mouth while she thought. Then she smiled, held up her hand for me to be quiet and she wrote furiously on a piece of paper. When she’d done, she pushed the paper across the table towards me – hand with perfectly painted nails. I picked the paper up and read the first one out loud. “Do you have any strange writing habits?” I said. “You mean like me saying everything out loud as I type it?” I asked. She shrugged. “Only if you do that,” she said. (Hard to type how long she stretched out that single word. My turn to think about it. I’d done that quite deliberately, you see, so I said. I drifted off for a moment wondering whether it had actually made that difference, then realised that Caitlin was still looking at me. I looked at the paper again. “Where did you get the…. what’s that word?”, I asked. She turned the paper round to look at it. I looked at her. Spelling isn’t my strong point, and she seemed very positive. “And the inspiration for them?” she insisted. “Get on with it,” she said. “Well, do you?” she asked. “And the second?” Caitlin asked. “Was that the deal?” She asked. ISN’T THAT ONE OF THE MOST AMAZING THINGS EVER! JEREMY WROTE ME A STORY. Forever in debt. I owe you coffee. Highly, highly, recommend this book guys. Best place to read: anywhere close to someone so you don’t get terrified i.e airport. Author yourbestbookpalPosted on October 25, 2016 Categories BLOG TOURS!, UncategorizedLeave a comment on The Wrong Train Blog Tour! Hey guys, I am so so lucky to be interviewing the fabulous Marcus Sedgewick here today. I will soon be filming a review of his newest release The Ghosts of Heaven for my YouTube channel which will be linked down below for you guys to check out! Thank you so much for agreeing to this interview! Your latest book The Ghosts of Heaven is split into four different sections- this is not the first of your novels to be set like this- why do you choose this format? I wrote one other book, Midwinterblood, in seven parts. There are lots of reasons why I like doing this kind of thing, not least to challenge myself, and my readers’ expectations of how a book ‘should’ be. With GOH it gave me the chance to look across time and wonder about universal themes throughout history. I noticed this as I have read Midwinterblood too! It really does create a shape to the story, I think! Some parts of TGOH is set in the past and others, in the future. How much research did you do for this and what did you do for this? There was a lot of research for the 1st, 3rd and 4th parts of the book. The 2nd part (about the witch) mostly drew on things I already was familiar with from previous books. All in all, I spent a long time reading about spirals, archaeology, space travel, linguistics, early 20th century psychiatric hospitals and many other things besides, but I love this – it’s all part of the fun of being a writer. You must have had great fun researching psychiatric hospitals- that sounds fascinating! Each section is so different so it must have taken on a completely different challenge each time! How do you think you have evolved creatively as a writer? It would take a book to answer that properly, but in brief, I can see that I have changed over the last two decades and that I have become more self aware of how I’m working, what I’m trying to do. That’s not necessarily a good thing – it can be destructive to be too aware of yourself. Each time I have had serious writer’s block (four times in 20 Years) I might very nearly not have gone on writing, but each time I think I have come out with more to offer on the other side. I hope so. That’s so interesting, I never knew it was destructive to be too aware of what you’re writing… I will apply that to my own. What is the hardest thing about writing for you? To continue to find new and exciting things to become obsessed enough about to write a new, and exciting (to me) book, when I’ve already written 20 or 30 novels. It must be hard to find a new inspiration each time. What inspired you to become a writer in the first place? I was not inspired to become a writer really, not by any one thing, or person, I just felt I had to start to do it. So it’s not the angels coming down to inspire you. It’s just you. Finally, do you have any advice for aspiring young writers? Yes: Enjoy it. Don’t judge yourself. Judge yourself. Take it seriously. Have fun with it. Thank you so much again to Marcus Sedgewick for agreeing to this interview even though he is incredibly busy. I am so blessed. Author yourbestbookpalPosted on June 18, 2016 Categories UncategorizedLeave a comment on An Interview With Marcus Sedgewick! That’s why I’ve been so inactive lately, I’ve been practicing vlogging with my brand new camera. It’s so awkward-I mean, I am a generally excitable person, but stick me in front of a camera and nope. Shut Down. I think I will keep blogging as well and I’ll definitely link all my vlogs and videos right here for you guys! Maybe mini updates like this? Let me know what you guys want! Now I have to go figure out how to turn my camera on…. Author yourbestbookpalPosted on January 31, 2016 Categories UncategorizedLeave a comment on Is This BookTube You Say?! Okay, I know that it’s already the 10th of January but I still wanted to let all you guys know this month’s releases that I am most excited about! There are only two release dates for these 5 books so the 5th of January and the 28th of January- fab days for book releases I know! Anyway, this book (from what I’ve gathered) is about time travel and New York..? I think… But the main character is a violinist and I think it would be really interested to see how Alexandra Bracken writes musically. This will also be my first book by her and I’ve been eyeing up The Darkest Minds for ages! 2. 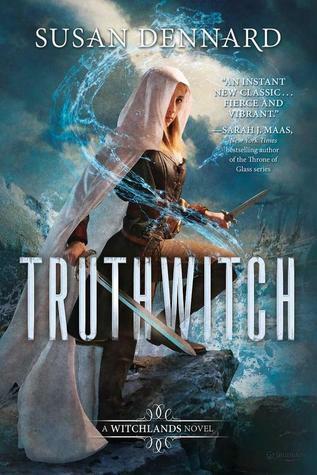 Truthwitch by Susan Dennard. Truthwitch is also a really hyped book for me and ever since I heard about the concept of two best (girl) friends saving the world. This is probably the first magical fantasy that focuses more on friendship than love and I cannot wait to see how that plays out! The author, Susan Dennard, is best friends with Sarah J. Maas who has quickly become one of my top,top favourite authors so I trust her judgment when she says this book is incredible! Another to add to my list for my birthday! 3. 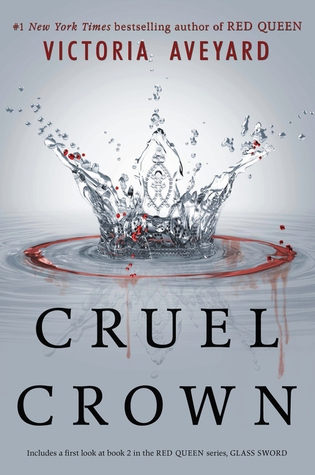 Cruel Crown by Victoria Aveyard. I read Red Queen back in the middle of 2015 and, come on, that ending though! Plot twist! I don’t know if I am necessarily going to read this book but it just serves as a reminder that Glass Sword is coming! If I feel in the mood for a novella I will definitely pick this one up! 4. 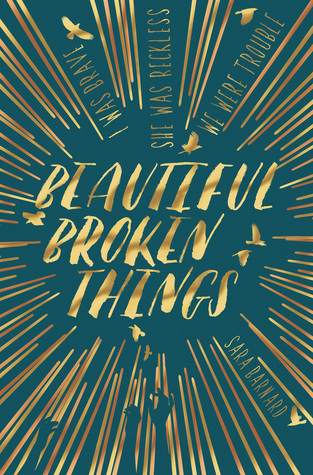 Beautiful Broken Things by Sara Barnard. I have actually already read this book and I loved it beyond words. I actually could not believe how amazing this book was… I’m still speechless. This would have actually made my top books of the year list but because I decided not to add ARCs to that list. But it was so close! I cannot wait for you guys to read it! I loved the elements of friendship and the way really difficult subjects were handled was absolutely beautiful. I’ve done a full, no-spoiler review so you guys can go read that if you’re interested! 5. All The Rage by Courtney Summers. I actually just finished a copy of this book- Macmillan was lovely enough to send me a copy, so thank you! This book was so poignant, so deep and rich that I just melted into it and became attached to all of the characters. I found this book so beautifully written and yet so heart-breaking that it was difficult to digest… Lots of mixed emotions surrounding this book. I will do a full, non-spoilery review to express my thoughts! And there you have it! There are the top five books I am most excited for this month! Like really, I cannot wait for a few of them… Yep I’m going to go order them now… I hope you guys do too! Author yourbestbookpalPosted on January 12, 2016 January 12, 2016 Categories UncategorizedLeave a comment on January Releases! I’m sure you guys really don’t want to hear about the boringness of my life but I just wanted to jump in to reassure you guys. Life has been so hectic here, what with going back to school and an English exam today and what not so… Yeah. Breathe Cait, breathe. Anyway, over the weekend, I will be writing a few posts for me to publish next week and maybe this should become a routine so I don’t have to do these updates and bore you. But anyway, I will be posting about a book I read a very long time ago and still need to review called Thirteen Chairs. My anticipated releases post for January is coming! Along with another book review for We Are All Made of Molecules which I read in one sitting! So, loads to come and I’m sorry I’ve been so inactive but that will chamge! I’m still getting the hang of this! Let me know any requests for posts you’d like me to write down in the comments! I don’t even think words could express how excited I am for this readathon! Honestly, all the hosts are so much fun and they are so nice so you should really go and check them out! Basically, this readathon is about reading as much as you can and having fun with it! It is not a stressful readathon at all and there will be loads of challenges and sprints to make our time so much more fun! I am balancing this with revision and work but… Who needs sleep? I thought I’d share with you the reading challenges and my TBR for the readathon! 1. Read the group book: Soundless by Richelle Mead. 2. Read a book that’s been sitting on your shelf for over a year. For this one I’m reading The Unbecoming Of Mara Dyer by Michelle Hodkin. I have had this book on my shelf forever and I have been meaning to read it forever so I though, why not? 3. Read a book over 300 pages. I could pick almost any book on my TBR for this one so I’m really in for a hard time but the one I’ve actually assigned to this challenge is The Selection by Kiera Cass. My best friend bought me the entire box set for Christmas and I am just going to marathon the rest after the readathon! Can’t wait! 4. Read a book from your favourite genre. I don’t really have a favourite genre so this one was also very difficult to pick but the one I chose for this was To All The Boys I’ve Loved Before by Jenny Han. I chose this because, in readthons, my favourite genre is an easy genre so I thought I’d pick that fluffy contemporary that’s been sitting on my shelf forever! 5. Reread your favourite book in a series. For Christmas, my amazing family gave me the Harry Potter and the Philosopher’s Stone Illustrated Edition! Because of this my favourite Harry Potter book is the first one because it is just so beautiful! I just can’t wait to dive into this, I am so excited! 6. Read a book based on it’s cover. A couple of weeks ago, the amazing people at Pan Macmillan HQ gave me loads of ARCs that are coming out in 2016 and one of these books was The Thing About Jellyfish by Ali Benjamin. Does that title not sound amazing?!?!? Honestly that’s all I’ve read about the book so far and I am just going to jump right in blind! 7. Read a book that’s been recommended to you more than once. For this, I picked Illuminae by Amie Kaufman and Jay Kristoff. Oh my God, this book is one of the most beautiful things I have ever seen. My parents just came back from America and bought me the stunning hardback edition from Barnes and Noble… I keep drooling, is that bad? I doubt I’ll be able to read all of these books for the readathon but if I manage to read three, I will be so proud of myself! See you at midnight guys! Author yourbestbookpalPosted on January 2, 2016 Categories UncategorizedLeave a comment on Winter Biannual Bibliothon!